Two machinima artists who met at Stanford University's Play Machinima Law conference a few months ago have tackled what Six Days in Fallujah was/is trying to address with a Call of Duty 4-created "documentary." 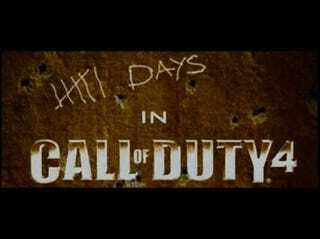 The movie, 6 Days in Call of Duty 4, was created by machinima artists J. Joshua Diltz and Joseph Delappe using both a static and roaming ground cameras for the capture. It's essentially nine minutes of a multiplayer match with nothing but the visuals, the sound of the game and music that I don't immediately recognize. They've created the project in "homage to the lives, both military and civilian, lost during the Second War of Fallujah." I actually got in touch with Diltz because I remember asking a question about Six Days in Fallujah at the conference during the Q&A. Damned if I can remember what I asked, but apparently, it left an impression. The idea for 6 Day originated from the conference. Your question I think actually sparked the concept that Joseph DeLappe conceived. Joseph was curious what six days in a military themed shooter would look like through a static camera. He wanted to see what effects combat would have in a virtual space, particularly how many deaths would occur and how many bodies would be left on the screen after 6 days of game sessions. I developed the point of view camera concept and also the console panel. I thought it was interesting to see what the conflict looked like from the ground perspective and how it correlated with real life events. The scrolling command console keeps the piece grounded in the virtual world. I found it quite intriguing that all the action on screen was visible in the scrolling data. It certainly separated the visuals which mirror real conflict from the data that was creating the illusion behind the scenes. Joseph will be showing a more somber version of movie in a gallery installation at the Beijing Biennale. That piece will include only the static camera which is visible in the larger pane of movie. You can download the video for yourself here. Thanks for the link, Professor Lowood!